The wonder of electric light made it possible to extend working hours later into the evening, but for those lucky enough not to be working, a whole new world of after-dark entertainment became available. Hanlan’s Point stadium was built in 1897 for the Toronto Maple Leafs baseball team. 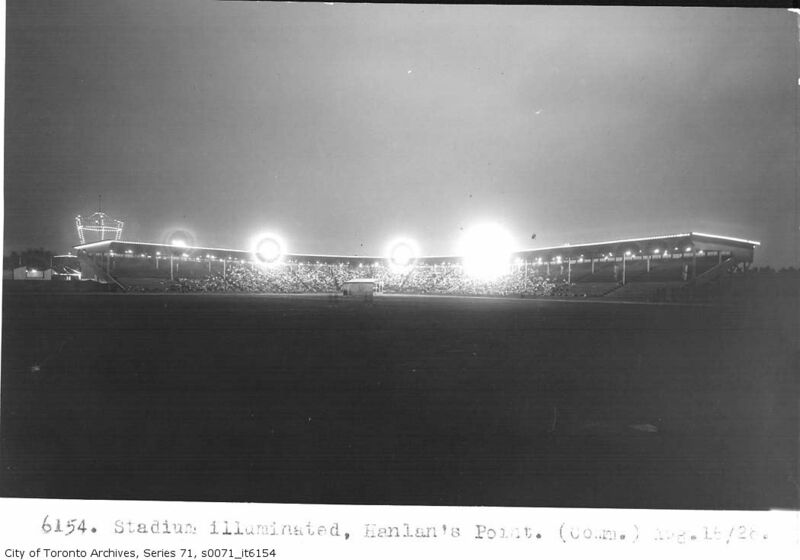 In 1914, Babe Ruth hit his first professional home run into the waters of Lake Ontario from this stadium. 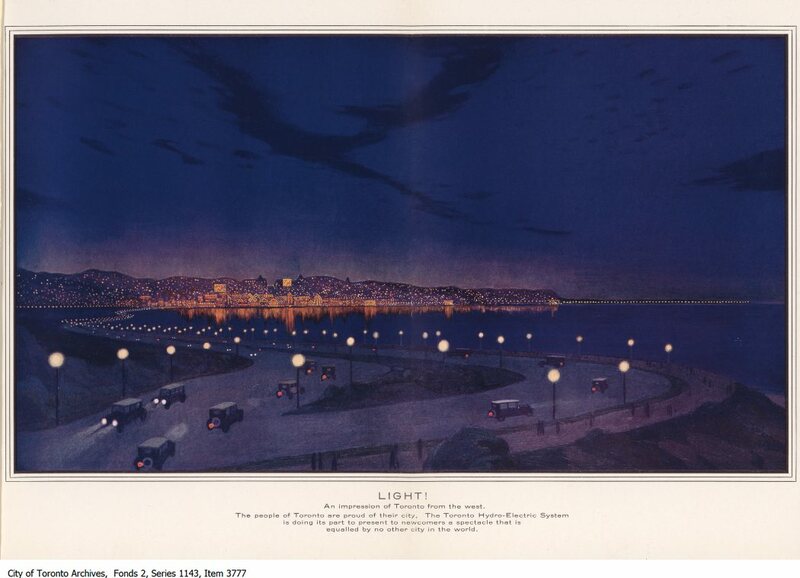 Night-time illumination for sporting events was particularly popular during the Depression. During the long, hot summer evenings, Torontonians thrilled to night baseball at Maple Leaf Stadium on Bathurst Quay and to softball games at Sunnyside Stadium. People also flocked to amusement areas such as Hanlan’s Point at Toronto Island, Sunnyside and the Canadian National Exhibition for evening entertainment. Midway rides such as the ferris wheel or the merry-go-round were immeasurably more exciting in the dark and few could resist the neon signs which beckoned one to try new and titillating fair games. 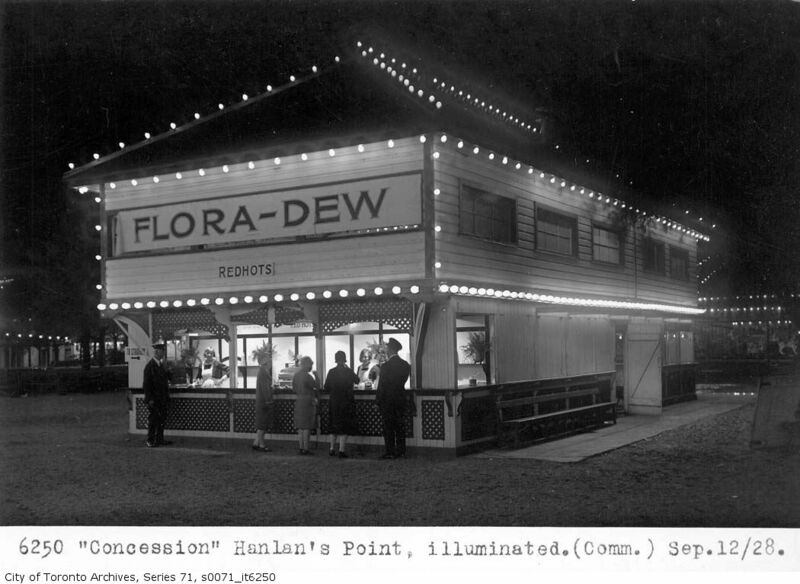 There were also concession stands lit up like Christmas trees, where you could satisfy all your cravings for Orange Crush and hot dogs. 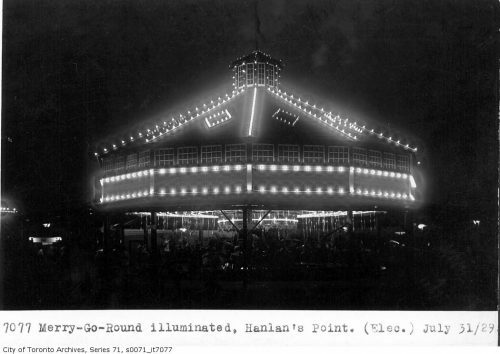 Hanlan’s Point originally was a sandy shoal at the western end of Toronto Island. Greatly expanded by land-filling, the area is now occupied by the Island airport. 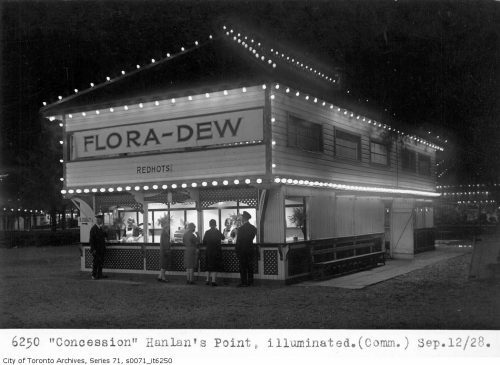 The amusement area existed from the 1890s to the late 1920s. For three weeks in August, the Canadian National Exhibition provides a playground for children and adults alike. 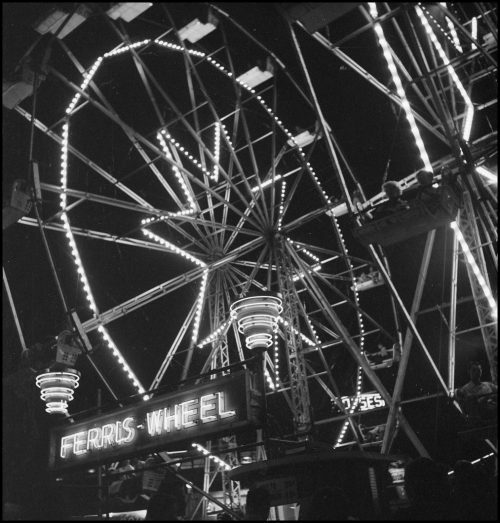 With these two pictures, one can almost smell the cotton candy and the corn dogs, and sense the peculiar excitement of the midway on a hot summer night. 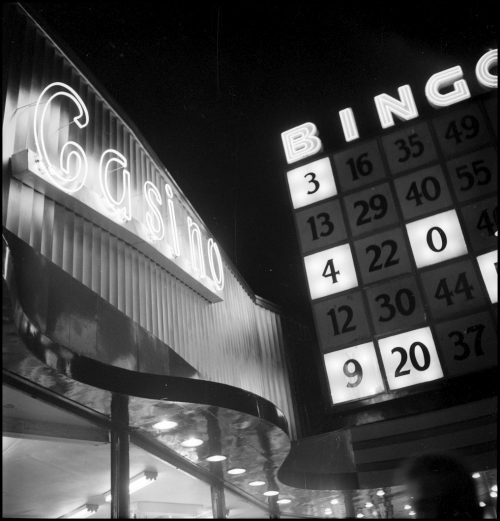 The Sunnyside Amusement Area opened to the public in 1922. It was situated on land that was formed from sand dredged from Toronto Bay by the Toronto Harbour Commissioners, pushing the original shoreline up to 600 feet out into the lake. The hydro towers that had been constructed in the water near the shoreline in the late teens consequently became landbound and ran through the north end of Sunnyside. 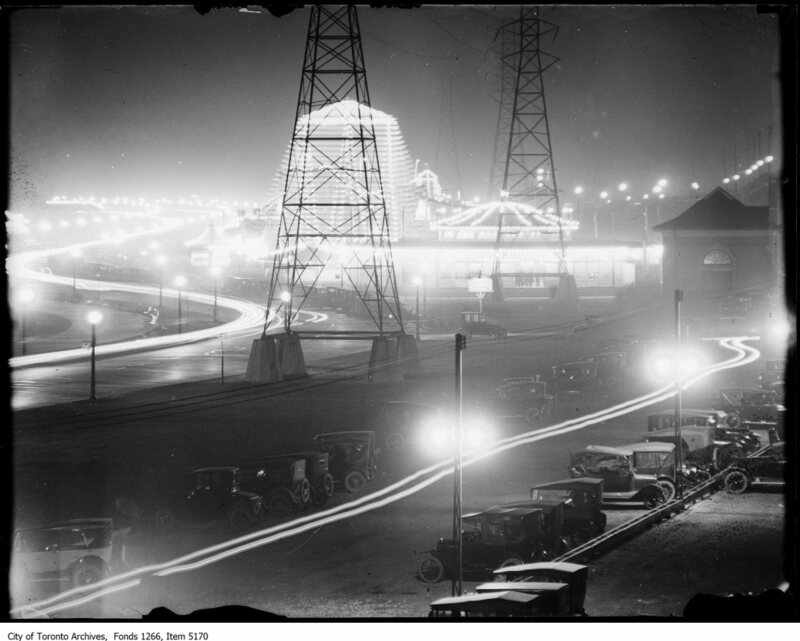 The amusement area was demolished in 1955 to make way for the Gardiner Expressway.